And here he is, the finished model. 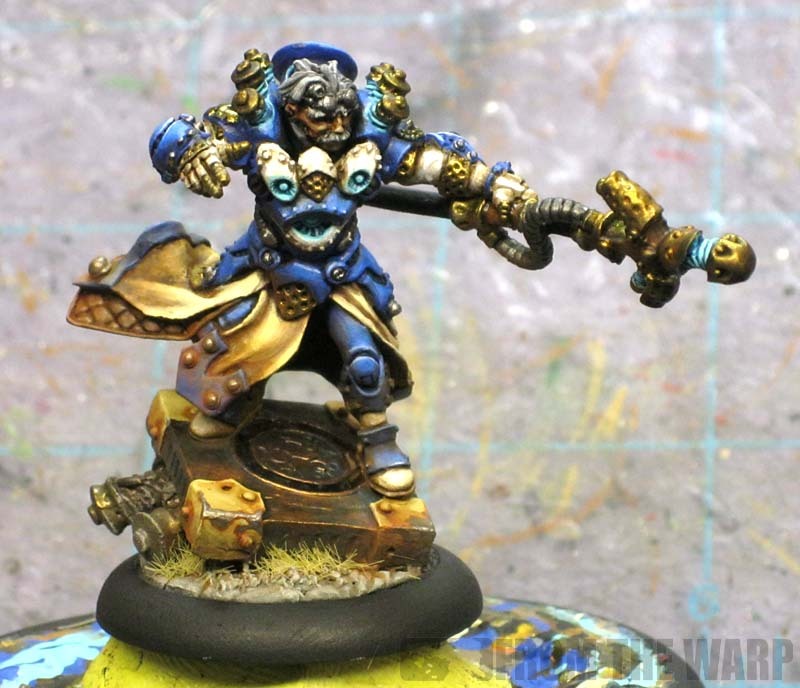 After a few days of painting, I think I was able to come fairly close to the artwork and the picture in the Cygnar book. He was a challenge to paint for a number of reasons. The first one being that it's the very first Warmachine model I've ever done. They (or at least this one) seem to be slightly smaller than your regular GW model. Because of this, there aren't the wide open spaces I'm used to painting on. It meant a bit more brush control for me. This guy has a good amount of detail too. It might be that he's a character model. It's not out of the ordinary for character models to be loaded with detail though regardless of the game system I bet. Sometimes they can be easier to paint than normal models since all you need to do is work on small sections at a time. You can barely see the stonework in the base since most of it is covered with the large metal object he's standing on, the static grass and a bit of sand. I did try and blend the model into the base using weathering powders. I even went as far as to add a touch of GW Devlan Mud to the static grass to help it blend in and so it wasn't the one color it comes out of the tub as across thwe whole model. Another effect (that's almost lost) is the verdigris on the metal block he's standing on. 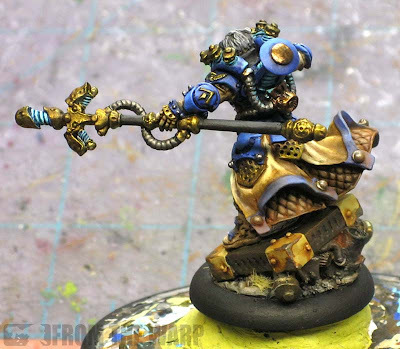 It was done with a thinned wash of GW Hawk Turquiose over a base coat of Tin Bitz. After it dried, I went back over and drybrushed a slightly lighter bronze color over the edges to show it had been worn back down to the bare metal. I think it looks cool, I just need to push the effect a little further next time so it isn't lost on the model. I kept the glowing effect to a minimum on this guy too. There are a few more areas on the real model that are glowing. I opted out of those ande decied to focus on the ones I could do to the best of my ability. That and I was worried it might be too much after the mishap with my Terminator Librarian where went way overboard with the OSL and then had to repaint a good portion of him to tone it down. I'm glad I got a chance to try my hand at painting him, it was quite the challenge. Daaaaaaaaaaaaaaaaaaaaamn! You smashed that out pretty quickly man! The subtelty is really nice and I think you did great job on this guy Ron, well done! Nice work Ron and very swift too! Red: I actually finished him off the other day... there is a slight lag between when I get things done and they get posted here so I didn't really paint him last night. Karitas: It's ok, they are my favorite part too. It's interesting that you say that "They ... seem to be slightly smaller than your regular GW model." It's been a couple of years since I've put Warmachine in the rear-view, but I'm pretty sure they're at a deliberately larger scale (32mm?). Anyway, I love this model, and you did a great job! Rushputin: Interesting... bigger you say? You know what, maybe they are. I didn't think to compare it to any of the 40k models I have lying around to see what the scale difference was. Maybe it's just that it felt smaller since the model seemed much less bulky compared to the Space Marine Terminators I'm usually working on. Good looking Nemo! Going from WM to 40k and back is always a challenge for me as well. Marines are pretty straightforward to paint, since it's all flat planes and the occasional cloth. I find models from other companies often tougher to paint...or at least very different. I'd suggest trying to paint a Trollblood. Damn, those dudes were a challenge for me. All blue flesh and Scottish kilts n stuff, lol. Sgt. Brisbane: I find myself looking at models these days thinking about how cool it would be to paint them. Like looking at them for the painting challenge instead of building an army. It looks beautiful, but won't the base need to be painted to indicate facing for it to be truly finished? Something this awesome deserves more just a white paint mark on either side by who ever ends up owning it. Went: Good point, I never thought of that. I suspect Matt (the gentleman the model was for) will take care of that feature when the time comes. It never dawned on me to try and add it myself. I have a habit of washing my miniatures after assembling them and putting them on their bases, but before putting the basing material on. I use water, an old tooth brush and a couple of drops of washing up liquid in a plastic container. Then I rinse them under running water. Am I being too precious, or is this 'normal'? Marshal: Thanks, I don't know about any more Warmachine models, I need to go back to something I'm comfortable with first before I venture back out into the unknown. As for washing your models, it may be slight overkill for most models, but you can never go wrong cleaning them before you start work. I do it to the majority of my models as well. Thank you so much Ron, I truly appreciated what you have done. I really love being able to watch everything move step by step. You did an amazing job. I am almost done with this guy's partner in crime for the charity auction, I'll keep you updated. MFC: Sounds good. I'd like to get a pic of the completed army when it's done if that's doable.